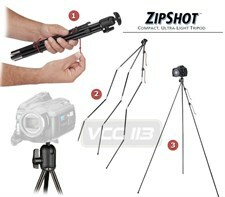 The Zipshot® Mini tripod is ultra light, easy to carry and sets up in a snap! Just release the two red shock cords and the legs of the ZipShot® Mini spring open in seconds. Attach your camera and you’re ready to shoot!